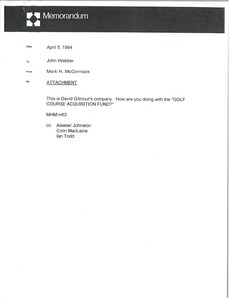 Japan - Would like her to coordinate with the Japan office to see if they are able to accept John Webber's request to use IMG's barter arrangement so he could stay at the Capitol Hotel in Tokyo in combination with the McCormack's already staying there as well. 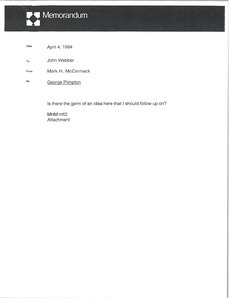 Attached is John Webber's memo requesting to stay at that hotel. Sending him photographs. Please note, enclosure not included. Asking if he should follow up on the idea of George Plimpton using his trademark n the opera, Carmen. Regarding issues with IMG Artists division giving salary raises before the time they should. Attached are memorandums discussing topics they cannot approve for an individual such as an early raise, a company car, and funding for a staff morale event.